ARK Storm K35+ is the low bugdet smartphone powered with 1GHz Dual core Mediatek Processor. The phone comes with 3.5 inch IPS screen with a resolution of 320 x 480 pixels. 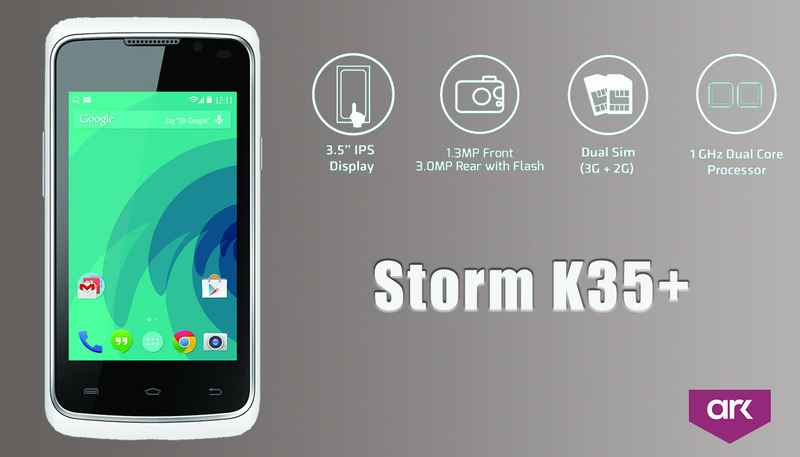 The Storm K35+ is equipped with 256MB RAM with 2GB Internal Memory which can be expanded upto 32GB via microSD card. The Storm K35+ runs on Adroid 4.2.2 Jelly Bean OS. It has 1.3MP front camera and 3MP primary camera with flash. It's a Dual sim smartphone with 3G supports. ARK Storm K35+ is the low bugdet smartphone powered with 1GHz Dual core Mediatek Processor. The phone comes with 3.5 inch IPS screen with a resolution of 320 x 480 pixels.